Traditional or "old fashioned" braces bind the archwire to the bracket with a rubber band, which creates heavier forces on your teeth. 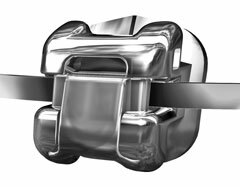 Because the archwire is bound to the bracket and cannot move, when you have a routine adjustment (more commonly known as "getting your braces "tightened"), the majority of the movement after an adjustment is concentrated in the first 3-4 days after an adjustment, which can result in increased tenderness for the patient! 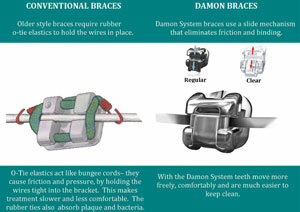 Damon® System braces are different! Damon uses tie-less brackets that don’t need to be “tightened”, and the wire is held in place with a small channel in the bracket. The special shape memory wires spread out your tooth movement over the entire time between appointments, so the movement is spread out over a long period of time. This is a much more gentle way to move teeth and creates much less tenderness for you!!! Also, gentle forces are healthier for your teeth and roots. The Damon System is the lowest profile bracket available, so they look much smaller on your teeth! 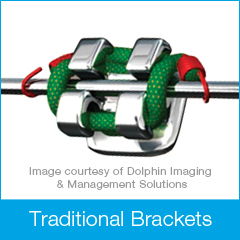 There are two Damon options to choose from: Silver or Clear brackets. Treatment time is typically shorter than with traditional braces, and you have longer intervals between visits… 8-12 week intervals compared to 4-6 weeks with traditional “old fashioned” braces. 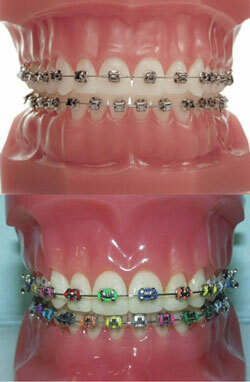 Many of our patients ask us if they can still have the "fun colors" on their braces. These are the fun colored elastics that wrap around a bracket that you can customize with your favorite color, school colors, sports team colors etc. Even though Damon does not require these elastics to bind the wire to the bracket, you can still have them ---- THE ANSWER IS ABSOLUTELY YES!!! They are non-functinal, but look just a fun and make a creative indivdual statement as they do with traditional braces. They can be put onto your braces at no additional cost, are just for fun, and you can get to choose different colors every time you come in!